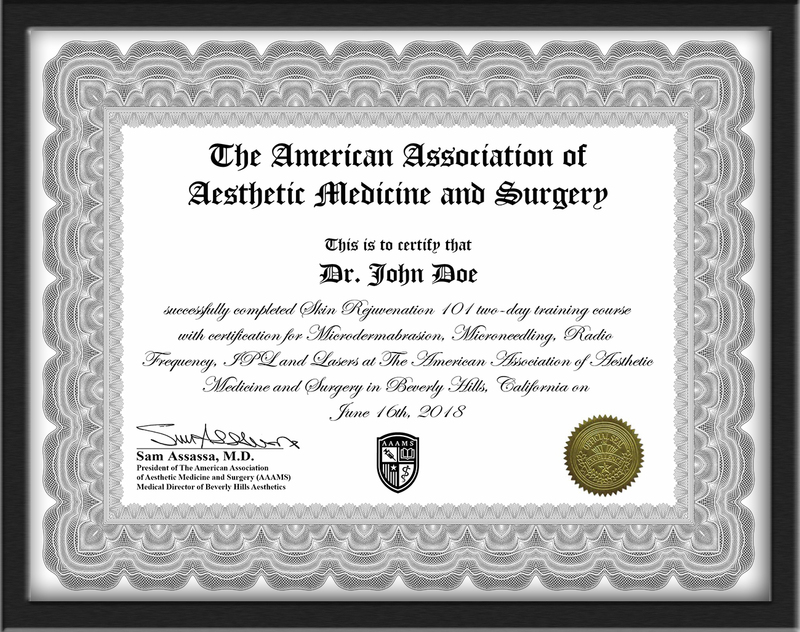 Attendees will receive certification from The American Association of Aesthetic Medicine and Surgery (AAAMS) conducted by experienced clinical instructors. This course is intended for practitioners with minimal to no previous experience performing aesthetic procedures that are looking to acquire the proper knowledge, skills and certification. It is a comprehensive training course where each attendee will learn all of the latest modalities in aesthetics. AAAMS offers the support, resources and consent forms to help you get started! Saturday and Sunday, June 15 – 16, 2018 – 8:30 AM – 6:30 PM | $695 Early Bird Special (reg. $895) Expires June 7, 2018 – Register Today! Upon registration, attendees will be granted access to the online learning management system and enrolled in Introduction to Aesthetics 101 online program by Dr. Sam Assassa, President of The American Association of Aesthetic Medicine and Surgery. This program starts with a brief introduction describing how the art of aesthetics directly ties into the field of facial aesthetics. This program introduces members to the concept of facial BeautiΦication, with an emphasis on the Greek symbol Φ, which represents Phi, described in this program as the Golden Ratio of Beauty. This program also introduces members to the ideal facial dimensions and how they relate to the overall appearance of the face. In addition, this program provides an in-depth look at the facial anatomy described as Facenatomy. Lastly, members will understand the aging process and how to apply the 4R’s of Aesthetics to restore beauty and youth in the face. Disclaimer: Please note that faculty and program are subject to change without notice. What is Radiofrequency & How Does it Work Aesthetically? For the best training experience, we limit this course to 12 trainees. Register in advance to save and reserve your seat today!